Traps are generally baited in the center and lowered to the bottom of the lake, river, bay or sea and allowed to sit for 15 to 20 minutes. 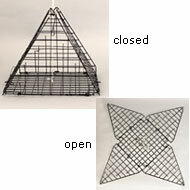 As they are pulled to the surface to check, the doors or sides of the trap close up, capturing the crabs inside. Shown here is a star trap, although they come in many varieties including boxes, triangles, and flats that fold up like a taco.